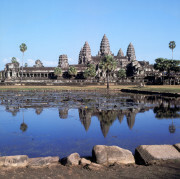 The beginning of the Angkorian period at 802 A.D. falls in the reign of king Jayavarman II. His court had its residence in Roluos. Phnom Bakheng, Prasat Kravan, and Pre Rup. This remote temple features finest stone carvings. Built in the classical age under the rule of Jayavarman VII, it has more or less been reclaimed by the jungle. Angkor Thom was a fortified city, built under the reign of king Jayavarman VII. The "mediterranean" temple that is partly grown by trees.